Thanks to Elm Creek Ranch of Hebron, ND for purchasing TOPAZ for $2950 as the high-selling female of the 2007 Salers Supreme Sale. See her in Denver at the National Salers Show Jan. 12-14 2008. TOPAZ is the second calf of one of the most exciting young females of our breeding program. Her dam, MAC PANORAMA 302P, is also the mother of MAC STERLING SILVER 43S, the $10,000 high selling bull of our Performance Power 2007 sale. PANORAMA is an attractive, feminine, easy-fleshing, sound-uddered and sound-structured daughter of MAC LENNOX whose first two calves indicate outstanding productivity. She is also a strong carcass trait female who scored an individual IMF ratio of 114 along with an REA ratio of 103. TOPAZ is one of the most powerful females in our 2007 heifer calf crop, displaying outstanding thickness, volume and performance. She is entered in Denver and, if the buyer would desire, we would be willing to exhibit her there. 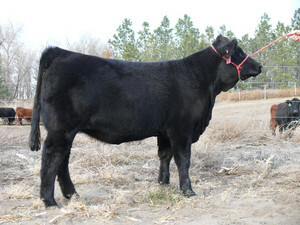 Here is an opportunity to own a female from one of MacDonald Ranches great cow families.